Whoa, hello there December! I swear this year you were two weeks early, or maybe I just need two more weeks of you. In any case, you're here and we're in the thick of holiday gifting. It was both fun and challenging shopping for the girls this year. What do you get a younger sibling who seemingly has everything she could need? I've given a lot of thought to this and other gifting quandaries and wanted to share my little list of favorite items. Some we've had for a while and some are newly acquired but all are well loved and hail from our favorite manufacturers. 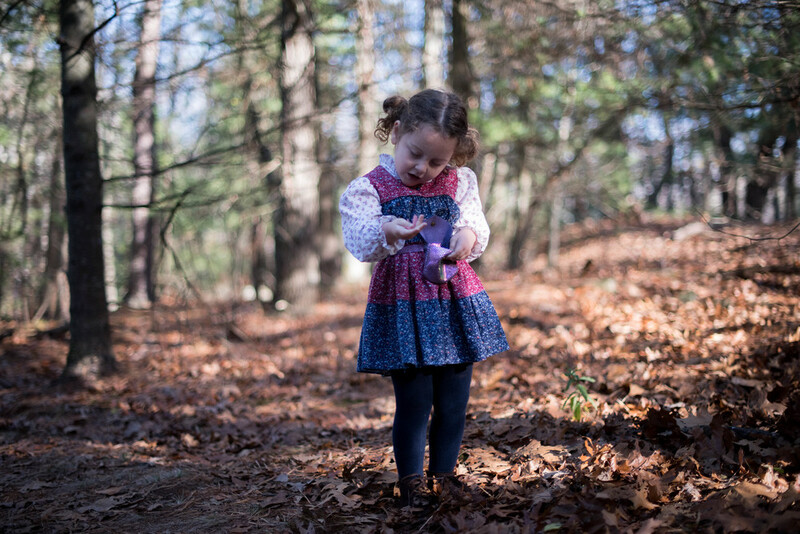 From one maker's hands to our little hands, there is something special that transpires during the holiday season of giving. 1. Sarah & Bendrix Handmade Wooden Dog with Xylophone - I cannot get over this gorgeous toy which was handmade in the Czech Republic from sustainable sources. As you pull the adorable doggie across the floor, he plays a xylophone with a darling 'ting ting.' I'm also a sucker for sentimental packaging. With every Sarah & Bendrix toy, a special tag reads, "I have traveled from a small factory in the heart of Europe, to be your friend. You can name me and take me on all your adventures. When you grow up, pass me on to other children, so I can recount all our tales...I'm here to stay." 2. 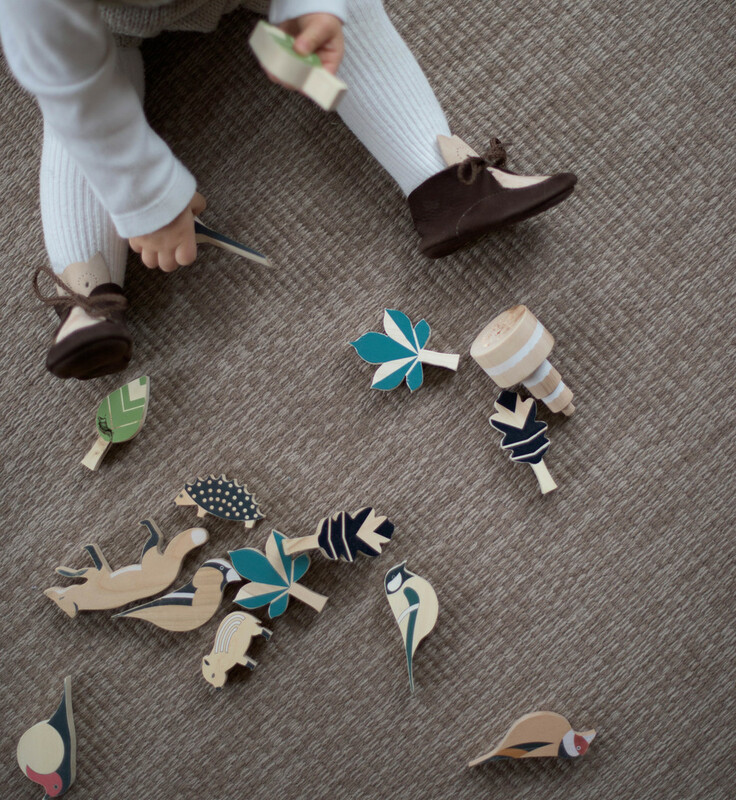 Eperfa The Hillside Forest Set from Over the Ocean - These darling wooden figures were inspired by the surroundings of Lake Balaton in Hungary and the hills around Budapest. Each piece was thoughtfully created to represent the natural world that surrounds these regions. They in turn inspire us to appreciate and protect our own environs. 3. 1978 Fox Boot in Chocolate from Zimmerman Shoes - I don't think I could have imagined a more perfect shoe for Mila's first steps. 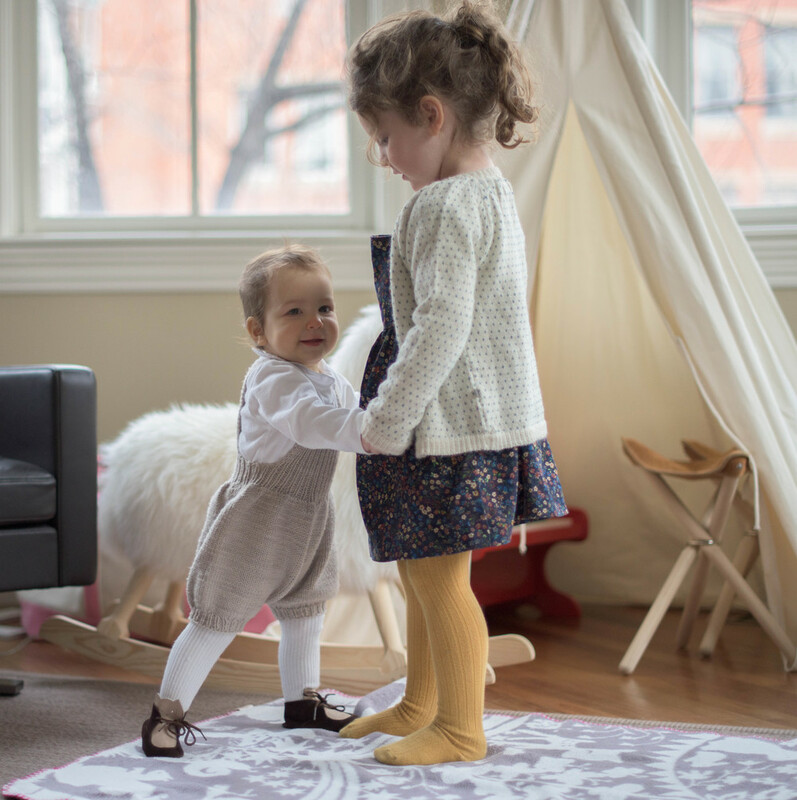 As her confidence builds and with the help of her big sister, she'll be walking before long. These gorgeous baby booties are sturdy enough to support her baby steps and double as a beautiful heirloom decoration for baby's room. 4. 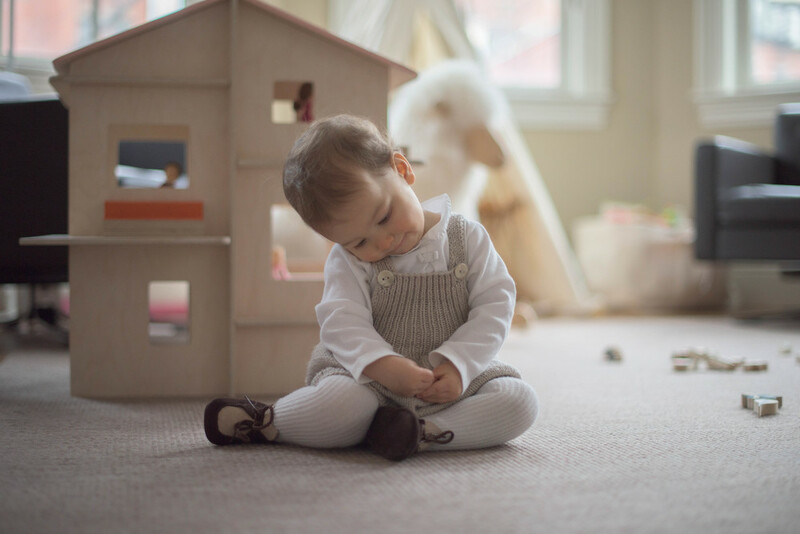 Bambi Blanket Beige in Organic Cotton from Fabulous Goose - A great gift for anyone in the family, you simply cannot go wrong with a Fabulous Goose blanket. 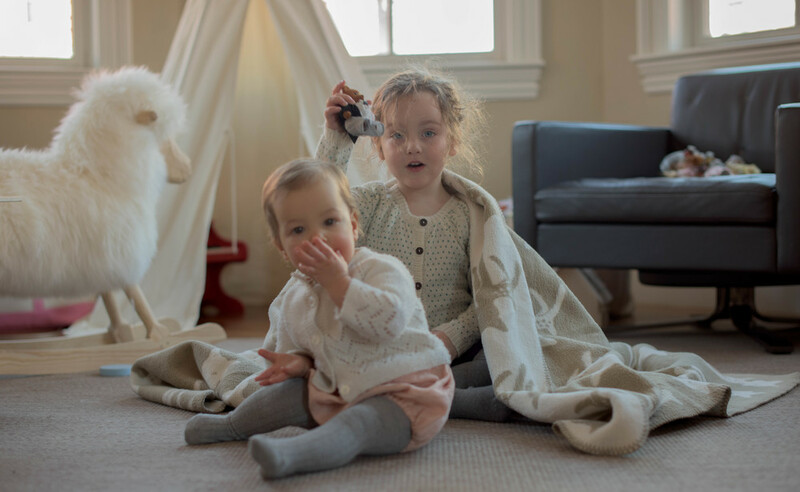 Thoughtful Scandinavian design paired with organic GOTS certification is a recipe for one 'Fabulous' blanket. They have served us well, from stroller rides, to picnic settings and most recently, designated dance floors for indoor lip sync parties. 5. Sugar Plum Adventure Belt from Oma + Jo - We've been eyeing these adventure belts from Oma + Jo for some time now so when they came out with a (gulp) shiny purple version, there was no hesitation. We are at the age of favorite colors and purple rules the roost these days. With a little hint of glitz and a big appetite for adventure, this belt has quicly become a favorite place to stash our treasured findings.